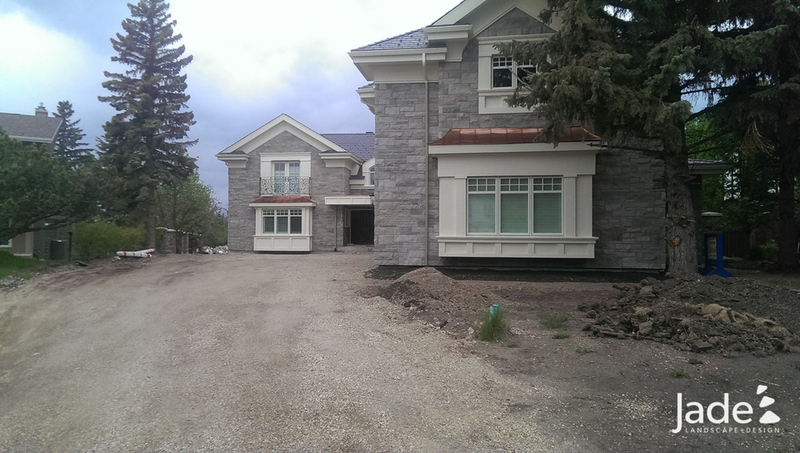 In 2013, these clients were doing a full renovation and addition to their home on Blackmud ravine and contracted Jade Landscape + Design to do the landscape. The renovated house, reminiscent of an Eastern Canadian estate home, sits on a half-acre of land, an extraordinary size for a city lot. The landscape accordingly, was to be large in scope and elegant in scale. We engaged Stefan Luchinger from Design North Landscape Architecture to work with us and the client, and come up with a plan that would be reflective of these needs. The resulting design was just that, with abundant hedging and mass planting in a linear bed design. This gave a structured architectural look without overwhelming the eye with profuse flora. A wide circuitous natural stone pathway leads in both directions to the rear seating areas. The client had imported Owen Sound Limestone for the house exterior, and wanted a walking surface that would present well with it. 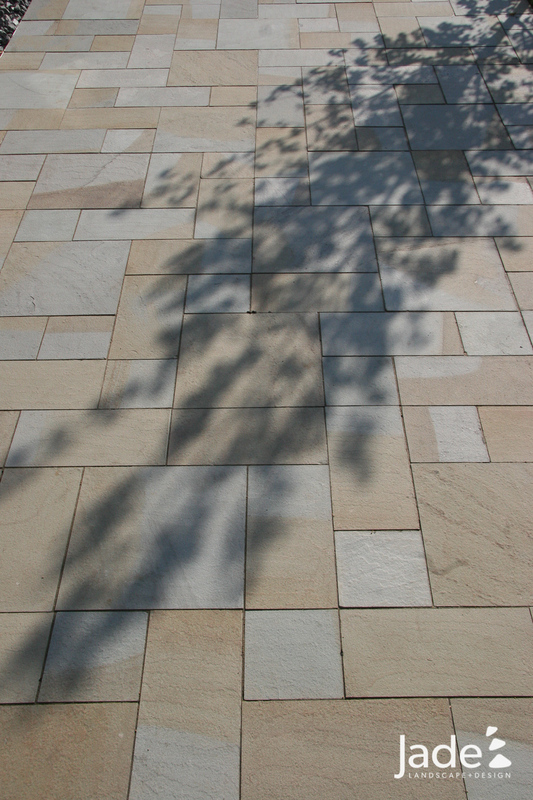 We felt a large dimensional stone would be appropriate with the geometry of the design, and so we sourced and imported a flamed sandstone paver with hues of tans, greys, and blues that we felt would match well with the house. After laying only 50 square feet of it, we knew it was going to be a homerun. 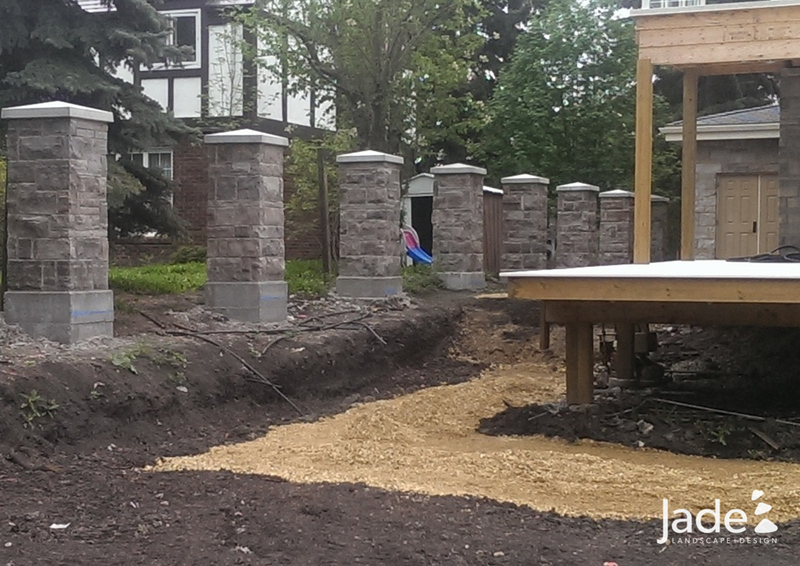 To deal with considerable cross slope on the north side of the yard, we poured a 100' concrete grade wall and faced it in the Owen Sound Limestone, with a custom concrete coping to match the home and custom fence pillars. Steps down to the backyard were solid sandstone treads from the same quarry as the pavers.The risers show off a rich variegation in the stone colouring, the result of millions of years of metamorphic geological formation. They are a definite highlight. We are thrilled with the finished landscape 2 years later, and more importantly, so are the homeowners. For Edmonton, this is a splendidly unique landscape and it was a real privilege to be involved. We look forward to seeing this yard evolve year over year.